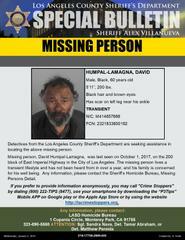 Los Angeles County Sheriff’s Department’s Missing Persons Unit Detectives are seeking the public’s assistance in locating David Humpal-Lamagna. He is a 60 year-old Black male, who was last seen October 1, 2017 on the 200 block of East Imperial Highway, Los Angeles. 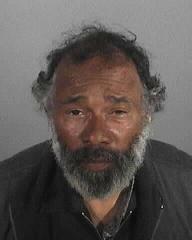 Mr. Humpal-Lamagna is described as 5’11”, 200 lbs., black hair, and brown eyes. He lives a transient lifestyle and has not been heard from in over a year. His family would appreciate any information regarding his whereabouts.